ASECAP held a Dinner Debate, hosted by MEP Georgios Kyrtsos, on the theme "A manifesto on the Concession Model in Europe: A key element for a sustainable, efficient and safe road transport network" on Wednesday 9 November 2016 in the European Parliament in Brussels. ASECAP organised a high-level conference that analyzed the impact of the new European Directive on the award of concession contracts across Europe focusing specifically on the transport sector. 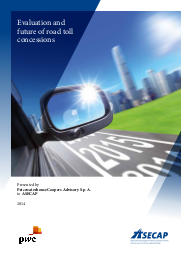 ASECAP has commissioned a study on the Concession Model to PricewaterhouseCoopers (PwC). The main findings of the study, entitled Evaluation and future of road toll concessions, were presented on the occasion of this conference. The study contains the perspective of Toll Road Operators on the importance of this key tool to ensure consistent and long-term investments in the Europen transport network. Furthermore, the study provides a comprehensive insight into how the Concession Model has been implemented in ASECAP member countries so far. 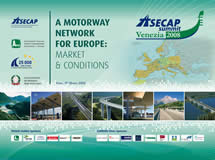 "A Motorway Network for Europe: Market and Conditions"
In addition to its Annual Congress (the so-called ASECAP Study & Information Days), ASECAP organises other annual events, namely the Road Safety Event and the Think Tank. Furthermore, ASECAP organises ad hoc events. Hereafter you will find these different events. In order to be directly pointed to the event of your choice, please click on the relevant item.